The Peloton System enables teams of professional drivers to save fuel by drafting safely. The Peloton System is designed for interoperability across different truck makes and models. Drivers complete Peloton-approved training before they can platoon. Platooning does not change hours-of-service requirements. Only drivers within their HOS limits can operate in platoon. Drivers can platoon on multi-lane divided highways that have been approved by Peloton. Peloton pre-maps a network of approved roads for platooning. A truck’s platooning capability is disabled automatically outside of the approved road network. Platooning is allowed in fair weather and light traffic. The System automatically disables a truck’s platooning capability during inappropriate weather and traffic conditions. On approved roads in good conditions, drivers can decide when they want to platoon. Who Can I Platoon With? The Peloton System will be used at first by drivers within the same fleet. Soon, drivers in different fleets as well as owner-operators will be able to drive in “cross-fleet” platoons. Drivers in a platoon must have completed Peloton-approved instruction and be in compliance with hours-of-service limits. What If There’s A Cut-In? Most of the time, an alert driver will anticipate a cut-in and react by ending the platoon ‒ either by pressing the Peloton System’s start/stop button or by the follow driver applying the brakes. In the event that the driver doesn’t see the cut-in until it happens, radar will detect the cut-in and automatically separate the trucks. When the platoon ends, the trucks automatically separate in a controlled manner (“fallback”). The Peloton System has redundant, continuously active features in place to detect cybersecurity faults. Any fault detected during platooning will result in the platoon ending automatically ‒ returning the trucks to “failsafe” mode under manual-only control by the drivers. Peloton encrypts and mutually authenticates all vehicle communications including truck-to-truck (“V2V”) and truck-to-cloud (“V2C”) communications. To stay at the leading edge of vehicle cybersecurity, Peloton follows industry best practices and uses independently audited cybersecurity systems. 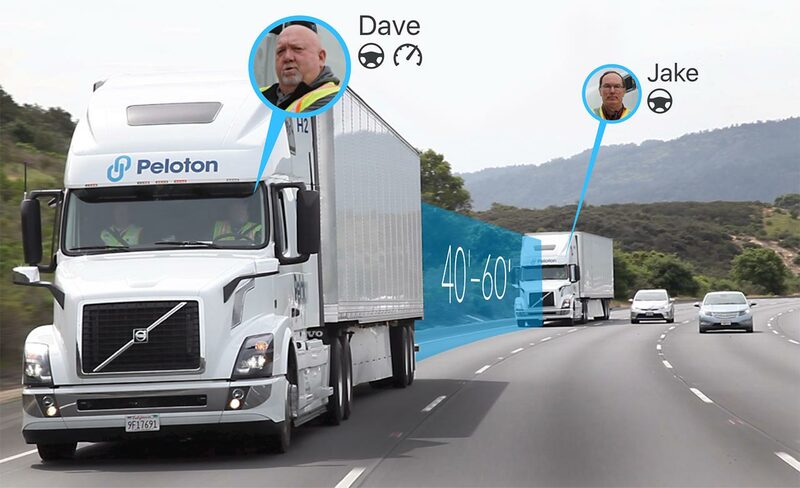 The Peloton System enables drivers in platoon to communicate directly through audio and video, and to protect against knock-on traffic hazards by extending active safety systems across pairs of trucks. The System features an in-cab video display which shows the follow driver the view from the front of the lead truck, providing the follow driver a clear picture of the road ahead. This frontal view helps the follow driver anticipate changes in speed and prepare for lane changes. In addition, the System provides a dedicated audio channel between drivers in a platoon. The audio channel can be used to share information about cut-ins and traffic ahead, provide a heads-up when a driver wants to end the platoon, and more. Finally, by linking forward collision avoidance systems across pairs of trucks through V2V communications, the Peloton System extends the effective range of radar and active braking of the follow truck in a platoon. When the lead truck applies its brakes, the follow truck responds automatically in just a few hundredths of a second. These forward collision avoidance systems provide best-in-class safety features that are always active, supporting drivers both in and out of platoon. When a driver chooses to platoon, he or she can be confident that their platooning partner has also received Peloton-approved training. Along with “connected braking” ‒ which bypasses delays in human perception and reaction time ‒ a safe following distance of trucks in platoon is maintained by ordering the truck with the longer estimated stopping distance as the lead truck. Fleet drivers may not always benefit directly from fuel savings, but many fleets offer fuel-economy incentives for drivers. In general, fuel savings will enhance the competitiveness of fleets and drivers using the Peloton System.